Today I have the honor of guest posting at Stash Manicure. I decided to post a tutorial for the raw edge applique that I used in my ‘Don’t Drink and Fly’ quilt. If you are visiting me for the first time from Stash Manicure, welcome! Today I would like to share some of my Halloween decorations in my home. Halloween is my favorite holiday, so much so that I even have some decorations that stay up year round. Before I show you my decorations though, I want to show the second Halloween quilt I made this year. 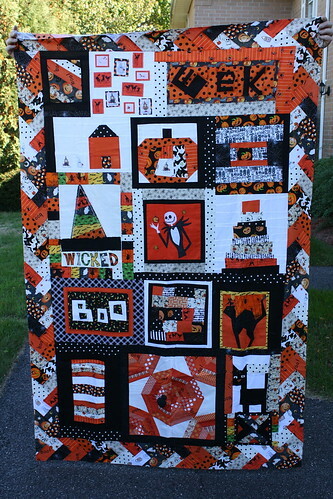 The quilt I showed for the tutorial at Stash Manicure was one of two Halloween quilts I have ever made. I have shown the second one here before, but I took a better picture of it. 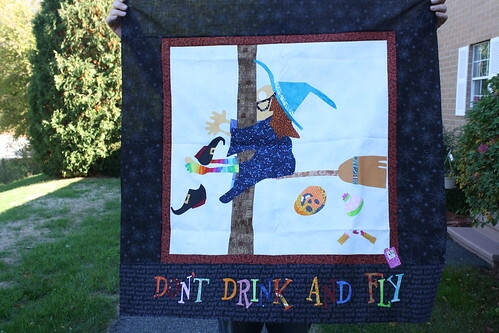 This Halloween quilt was not actually made by me. I collected the fabrics over a span of 2 years, and never actually made a quilt because I always felt it had to be perfect. When I joined a quilting bee, I decided to have the participants make blocks for me. Their ideas and blocks made for a way better quilt than I could have ever made for myself. Okay, now on to my home decorations! 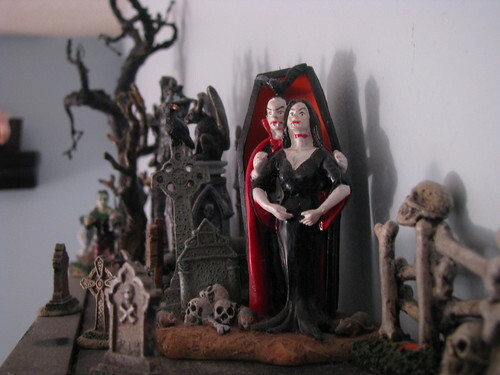 One of my permanent Halloween displays is in my bedroom. 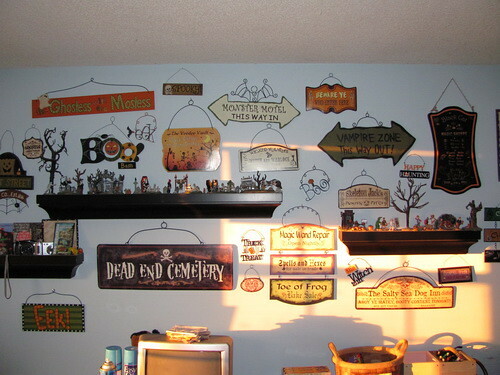 A few years ago, I had a few Halloween signs that really didn’t have a good place to go in my home at Halloween time, so I decided to hang them in my bedroom permanently. The collection grew from there. As I find neat new signs, I add them to this wall. 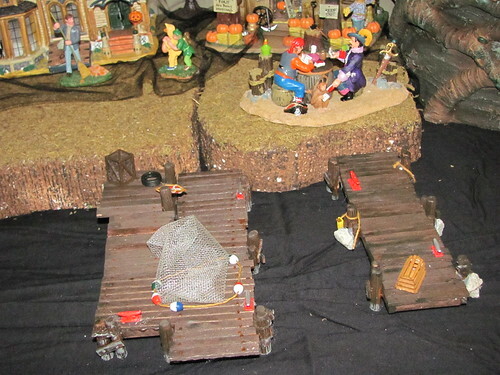 The shelves on this wall have some smaller pieces of our Halloween village as well. Every time I come in my bedroom, this wall makes me smile. Another permanent display in our house is the area above our kitchen cabinets. 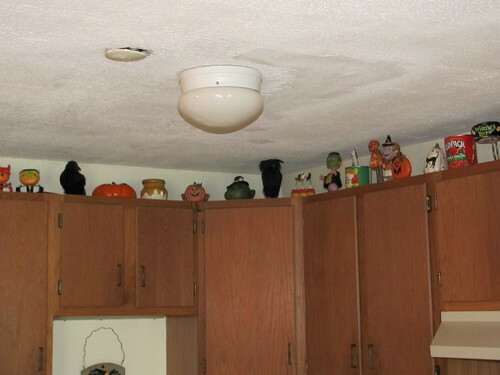 This is hard to take pictures of, but I have a bunch of Halloween related knick-knacks up there. I also have a few large old horror movie posters framed and placed around the house, plus a Halloween embroidery I did framed and hung in our bedroom. 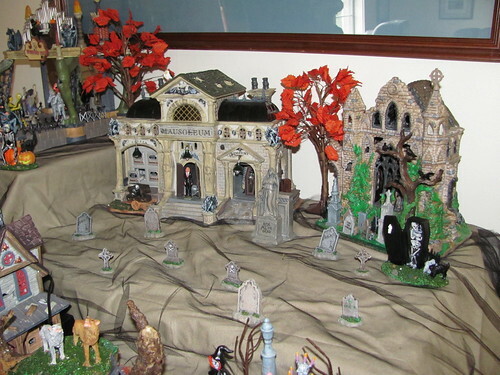 These permanent Halloween displays make me happy year round. 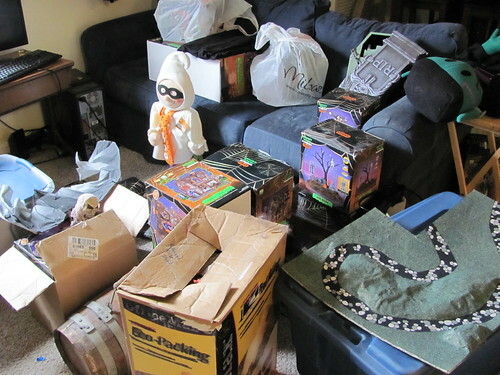 Here is a shot of all of our non-permanent Halloween decorations right when we pulled them out of storage. 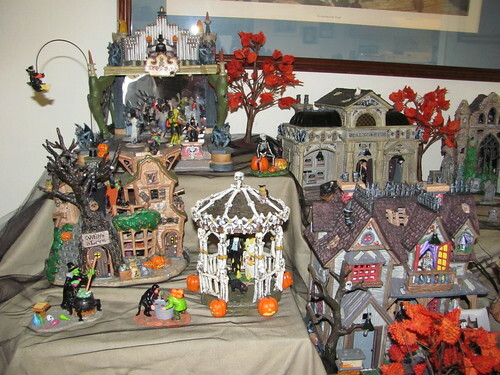 Most of the stuff in here is for our Halloween village. 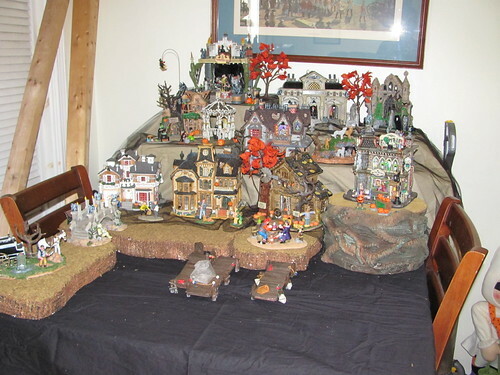 We have quite an extensive Halloween village. The whole village cannot currently stay out year round simply because we do not have the room, though someday we hope we can have it out year round. For now we set up part of it on our dining room table and the other part on a side table we have. I also do a little outside display for Halloween. 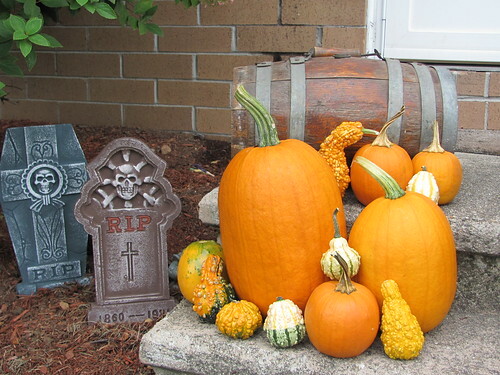 The two bigger pumpkins here are fresh from my mom’s garden. 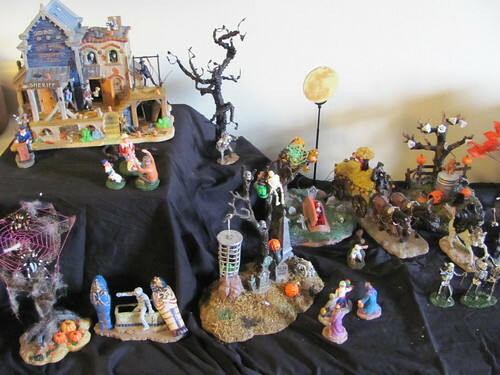 There are a few other little corners of Halloween in our house too that I don’t have pictures of right now. Our house is small and to be honest I don’t have a great home decorating eye. I would love to be able to transform our whole home into a spooky house, but we just don’t have the storage space for all the things that would require. So for now, we are happy to have our little corners of spooky. I hope you enjoyed my mini Halloween tour, be sure to check out Stash Manicure for my applique tutorial today. Mmmm I have a Godiva bear collection that are Halloweenie..that is as far as I go…although I do have 21 of them on a shelves…for every year we have been together…lol. 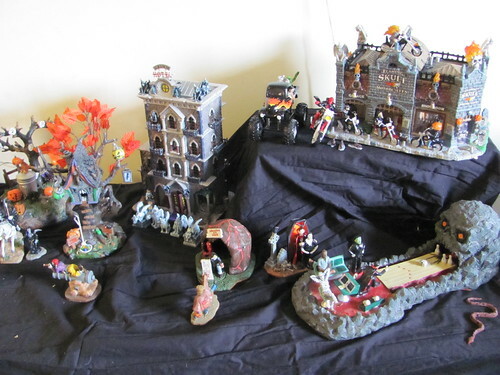 Our spooky village collection is bought at various stores around me. 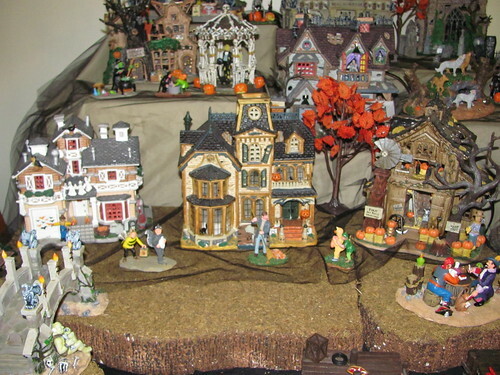 I am not sure where they are available that would ship to Australia, but if you do a search for “Spooky Town” you should be able to find some sites that sell the houses and figurines. 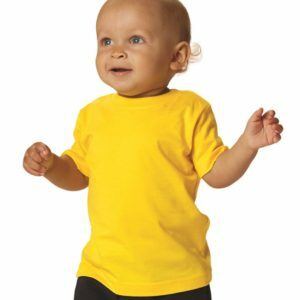 You can email them to see if they would ship to Australia. 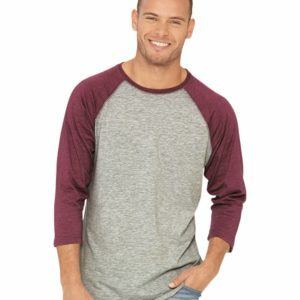 Another option might be ebay. A lot of sellers are willing to ship internationally and I have found a lot of the houses and figurines that way too.